I’m 20 miles into a 100-mile ultra race, and the trail is pure slop. Snow at the start turned to mud and muck. My feet? Bone dry. Polartec Neoshell is a waterproof/breathable material. I know, I know, waterproof breathable has its detractors, especially in footwear. The material will trap sweat and water, and your feet will get wet anyway. Well, not according to my test, or at least the first 30 miles of it. 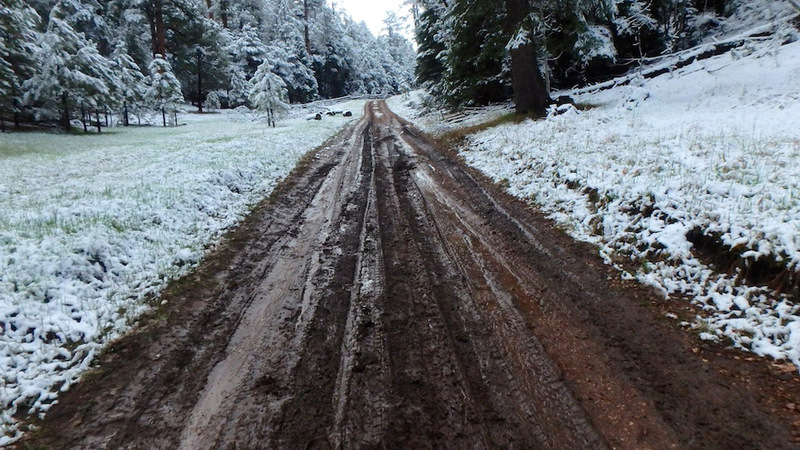 In the ultra last week (see my full race report here) I ran for 30 miles and then checked my feet… and they were dry. Impressed. 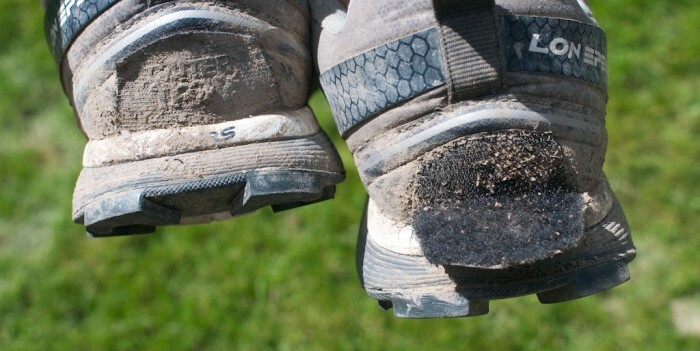 Neoshell is different than most waterproof/breathable material used in shoe construction. Instead of a waterproof bootie inside the shoe, Neoshell material is the outside shell of the shoe. This makes a lot of difference. Instead of a normal shoe with a waterproof layer embedded below upper material, Neoshell starts blocking moisture from the outside surface of the shoe. It works like a hardshell jacket for your feet. That means the inside of the shoe stays dry a lot longer. Neoshell wicks like a champ, too, with better air permeability than traditional waterproof fabrics. After running for about 30 miles I noticed a bit of moisture on my light wool socks while checking my feet at an aid station. Considering the trail (see photo above) this is amazing. Granted, my pace was slow — I was running 10 – 12 minute miles. And the temp was low, around 45 degrees F. So sweat was not as much an issue as usual. In my test I also wore Outdoor Research Ultra Trail Gaiters ($50) on my feet. 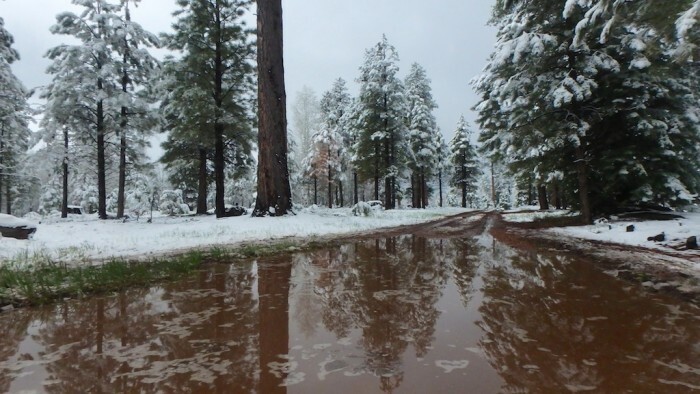 The combination created a truly waterproof environment and kept snow and water from infiltrating my shoes from the top down. Running gaiters attach easily as the Lone Peak 2.0 has a velcro “GaiterTrap” on the heel. Gaiters also kept water away from the tongue, which is NOT Neoshell and NOT waterproof. In many circumstances, this would make little difference. 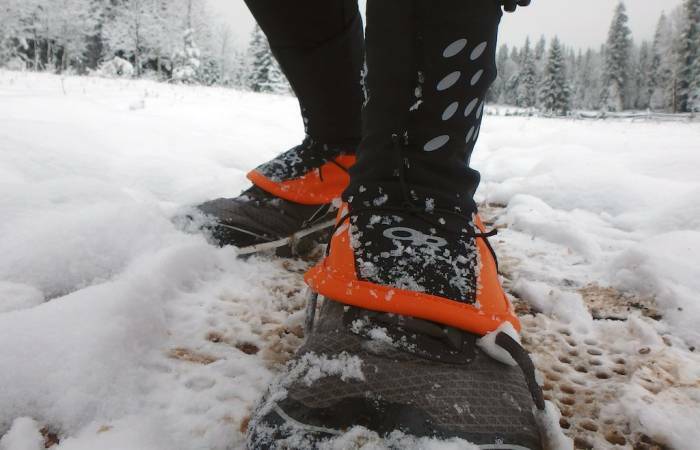 But if you are going to run through deep puddles, mud, snow, etc., gaiters take it to the next level. That’s not to say these shoes are good for everything. I used them once on a sunny, 70-degree day. My feet were HOT! These are cool to cold weather shoes, and best for sloppy, snowy or rainy conditions. The Neoshell model is based on the popular Altra Lone Peak 2.0. With a stack height of 26mm and zero drop from heel to toe, the Lone Peak 2.0 is popular among the ultra marathon crowd. I love the wide forefoot of this model, plus the exceptional traction that did its job even on muddy, frozen and snowy terrain. 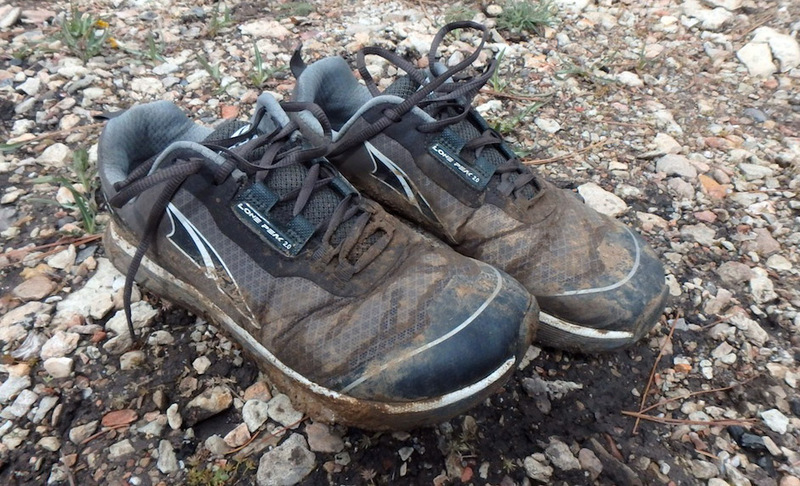 The Lone Peak is a mid-weight trail runner, tipping the scale at 11.5 ounces. Once out of the quagmire that was the first 30 miles of a 100-mile race, I switched to a lighter shoe. 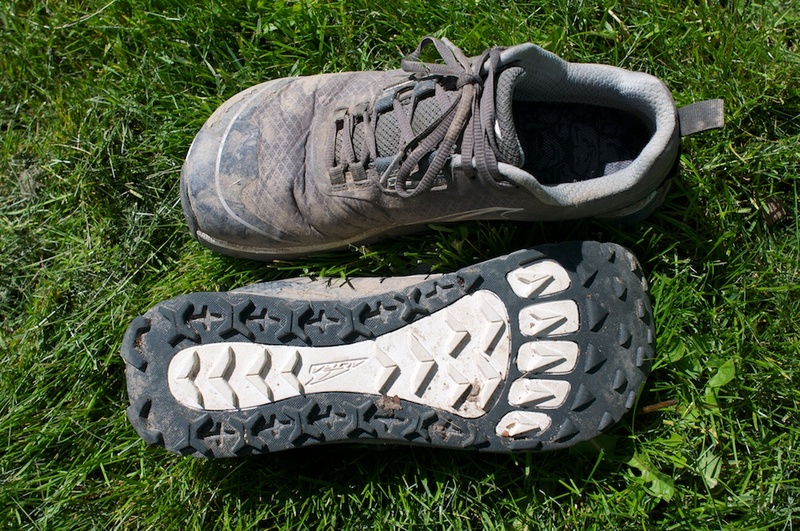 Trail running shoes make great hikers, and I’d be comfortable strapping these on for a long day — so long as the weather is cool. The wide, stable platform should be easy on the feet even under the load of a pack. I’ve worn these for several days around campfires and even at a muddy music festival and enjoyed all day comfort (and dryness). Thus far, I’ve put about 100 miles on this pair of shoes. They are in solid shape. $150 is a bit to invest in a pair of running shoes, and I hope to get a lot more miles out of these shoes. I will update with more durability details as I run in the shoes more this spring and summer. 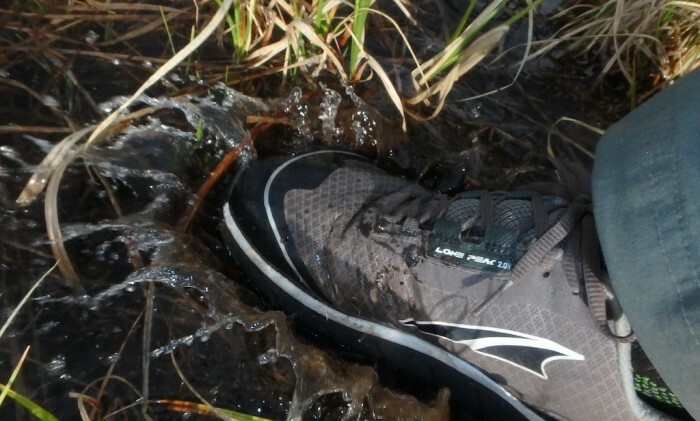 The Altra Lone Peak 2.0 Neoshell is an amazing option for cold, wet running or hiking. In my tests, the shoes kept my feet dry in conditions that would have saturated any other shoe I’ve used. If they fit your feet, and you can afford the $150 entry for a specialized set of kicks, I highly recommend the Lone Peak.